The Shortwave Report 01/22/16 Listen Globally! Read more about The Shortwave Report 01/22/16 Listen Globally! The Shortwave Report 01/15/16 Listen Globally! Read more about The Shortwave Report 01/15/16 Listen Globally! On the 13th of January, the Washington Post announced that Virgina school officials plan to close the schools during the March 1 "Super Tuesday" presidential primary. This is due to fear that Donald Trump supporters may react with violence to the state GOP's requirement that voters wanting a GOP ballot attest that they are Republicans. Donald Trump has been unique among all candidates in the 2016 Presidential race in endorsing violence against Black Lives Matter protesters and other enemies of his racist, xenophobic campaign. Thus it is reasonable to expect that violence or even organized rioting could occur if Trump supporters physically contest the state GOP's requirement for a Republican ballot. The Shortwave Report 01/08/16 Listen Globally! Read more about The Shortwave Report 01/08/16 Listen Globally! The Shortwave Report 01/01/16 Listen Globally! Read more about The Shortwave Report 01/01/16 Listen Globally! The Shortwave Report 12/25/15 Listen Globally! Read more about The Shortwave Report 12/25/15 Listen Globally! The Shortwave Report 12/18/15 Listen Globally! Read more about The Shortwave Report 12/18/15 Listen Globally! 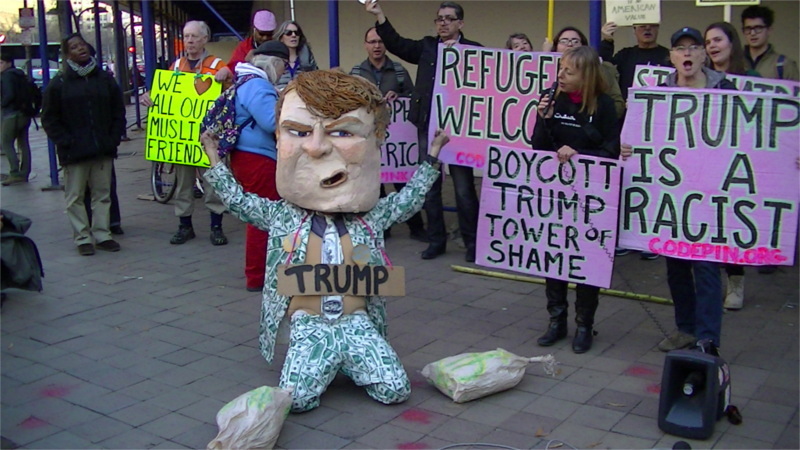 On the 10th of December, representatives of Code Pink and NOW joined area Muslims and at least one Syrian refugee at Donald Trump's hotel project on Penn Ave at 11th st. A huge banner with the word "racist" was held up under the giant "Trump" sign that some say violates campaign finance laws. Underneath, speakers condemned the incredible racist proposals that have been coming from Donald Trump's presidental campaign in recent weeks and called for a boycott of his hotel when it opens in 2016. The Shortwave Report 11/27/15 Listen Globally! Read more about The Shortwave Report 11/27/15 Listen Globally! The Shortwave Report 11/20/15 Listen Globally! Read more about The Shortwave Report 11/20/15 Listen Globally!